A survey into the number of claims made by the homeowners revealed that water damage is the most common homeowners’ insurance claim. Among the leading causes of water damage, is the washing machine. 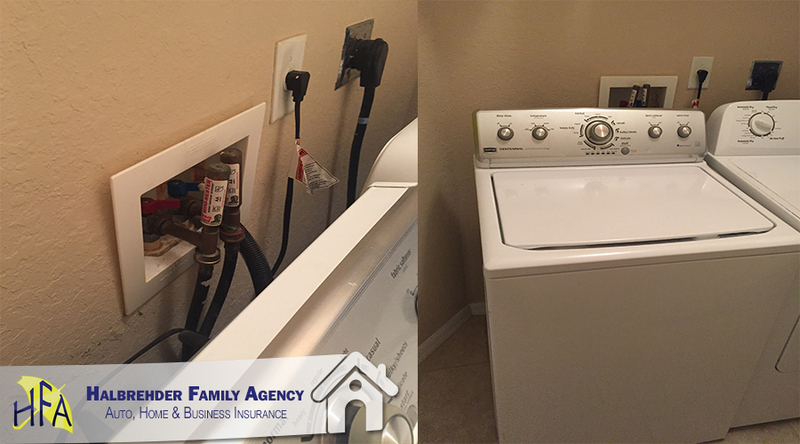 In fact, the washing machine related water damage is one of the top sources of water damage in residential homes. The survey also revealed that an average of over $5,000 was paid per every water damage incident Thus; it makes sense to take steps to prevent washing machine-related water damage. Most of the people do not see any threat in the washing machine. However, they leave high-pressure water coming into the washing machine every other minute while they use the machine once or twice a week. Over 60 percent of all the water damage incidents from the washing machine come from hose failures. Do not feed the water supply to the machine when you are not using it. There is a high risk that something might happen at the location of water connection and cause leakages. Since the water is under high pressure, a small leak is all that it takes to cause water damage. An easy to use lever-type valve is mounted at the back of your machine to make it easy for you to turn on and off your cold and hot water supply. It is easy to install and use and ensures that water supply is cut off when not needed. Ensure that the water hoses are checked every six months and changed accordingly. Hoses that have served you for five years should be changed whether or not there are signs of damage. Consider changing the unreinforced rubber hoses with reinforced braided stainless steel hoses. Braided steel hoses are much stronger and can withstand high water pressure without bursting thereby boosting your safety. Be on the lookout for any blisters, kinks, or cracks on the hoses. These are most common near the valve connection or areas where the hose may be folded and pressed tightly. Do not leave your washing machine working unattended. Even if you are just running to pick groceries nearby, just switch it off and back on again when you come back. It takes a few minutes of water leakage to flood your home and cause unprecedented damage, and claims on your home insurance. In fact, in many cases, the water damage in an unoccupied house is over two times more severe than the damage occurring in homes where there is someone around. Do not ram your washing machine against the wall. This helps avoid kinking your hose near the location of the valve. The point where the hose is folded and pressed against the wall usually becomes a weak point where the water leaks. Sometimes the water leakage may come from the loose connection at the valve. Always ensure that the connection at the valve is secure. However, avoid over-tightening the joint as it may damage the valve or the hose. When installing your hose, start by hand tightening the valve area. Complete by making a two-thirds turn using the pliers. You may also install the water sensors and automatic shut off valves. An automatic shut off valve senses the electrical current in the machine and opens the water valves. When the device senses that the machine is not drawing more current, it closes the valves automatically. Follow the operation instructions to the letter to lower the risk of water damage and other of washing machine water loss. Use the right detergents and do not overload the machine. In the case of a water leakage, your washing machine is more likely to cause higher damage when installed on the first floor than on the ground floor. Moreover, on the first floor, the machine is closer or above your valuable electronics and furnishings than when on the ground floor. Ensure that the drain hose is correctly inserted into the drain line. If not securely inserted, there will be dirty water leakage every time that you use your washing machine. Preventing water damage for your Florida home is easier than filing a claim after the damage has been done. If your insurance claim exceeds your homeowners’ insurance policy coverage limit (for extensive damage), you will have to cater for the amounts over the limit. Water damage also disrupts your life and plans before the mess is sorted out. Just follow the tips suggested above and lower any risk of having washing machine related water damage. See some tips for maintenance on your washing machine to prevent water claims. Water claims are the number one loss regarding home insurance in Florida.